When you hear the word melamine, you often think of cheesy 60’s dinnerware complete with brown and yellow flowers or multi-colored paisley. However, while it’s true that melamine isn’t used for dinnerware very often anymore, it can still be found in a picnic or camping set and the brightly-colored plastic dishes we use to feed our kids. Eco-friendly is another way of saying ‘earth’ or ‘ecologically’ friendly. In other words, something that’s eco friendly is ‘friendly towards the earth or ecological system. As progressive human citizens, it’s our responsibility to look after the physical condition of the world. This is the place where our sons, daughters, and ancestors will live, so we quite simply want to keep it looking as good as it possibly can. Something that’s eco-friendly claims to not harm the environment, and in many cases it’s also safer for human usage or consumption. The best way of determining whether something is eco-friendly is to find out if it has a certification seal or logo. For example, you can find out if something that consumes energy (electrical appliances) is energy efficient by looking out for the Energy Star logo. It’s a blue background with white writing and a white star outline. Melamine has existed for almost two centuries. It was first created and named by a German chemist called Justus von Liebig in 1834. In those early days, it was manufactured using calcium cyanamide. Converting this compound into dicyandiamide and then melting it would produce melamine. Nowadays, however, it is manufactured in a different way. A series of complex chemical reactions that begin with urea result in the creation of melamine. 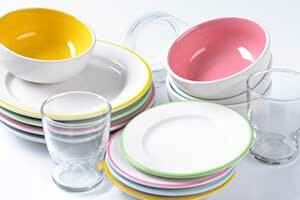 One of the most well-known melamine derivatives is melamine resin. Melamine resin is the material that’s used to make melamine dishes, so it’s this version that is placed under the microscope when we’re attempting to determine whether melamine dishes are eco-friendly. The disturbing fact about melamine resin is that it is made by mixing together melamine and formaldehyde. Yes, that’s right: formaldehyde. The two substances undergo a chemical process known as polymerization that results in melamine resin. But let’s hold off on the skepticism momentarily and consider the rise of melamine, including its uses and waxing and waning popularity. The original melamine that has not been mixed with formaldehyde is an ingredient in many of the common substances that are used widely. It can be found in concrete, industrial fertilizers, and even as a colorant in inks and plastics. Melamine wasn’t really used in dinnerware until around the mid twentieth century. It started as a fixture on US navy ships due to the positive characteristics of the material: lightweight and strong. You can imagine that unbreakable dinnerware is quite important on a ship, and metal was too expensive. The Second World War definitely contributed to the rise of melamine. Melamine is cheaper than metal under normal circumstances, and metal was particularly expensive during the war. Moreover, war is an expensive pastime, so no doubt cutting costs wherever possible is a welcome incentive. Around this time, melamine use began to spread far and wide, with millions of English and American people using it as their main form of dinnerware. 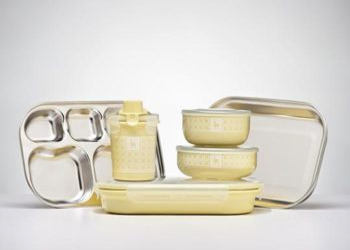 The logic is understandable: keep a melamine set for meals with the family, and only pull out the ceramic or porcelain when guests come for dinner. It actually started to challenge the position of ceramics as the number one material used in dinnerware: some ceramics actually started to produce melamine sets just to try to stay afloat in a competitive market. 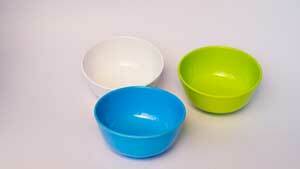 As time went on, however, people started to notice that melamine wasn’t a perfect dinnerware material. Sure, it might be unbreakable, but it get scratched and faded over a few years from knives digging into it and constant washing. Thus, by the 1970s melamine was no longer in vogue as a form of dinnerware. Still, it does have a sort of cult following among collectors who want to have all the melamine sets from old dinnerware companies that no longer exist. Plus, as previously mentioned, companies still make new melamine sets; just not for the adult dinner table! No, melamine is not eco-friendly. First of all, during its manufacture, a lot of chemicals are emitted into the atmosphere. It is not something which exists in nature, so it has to be created in a laboratory. This means that different chemicals are mixed, leaving behind chemical waste products and toxic fumes. Manufacturing melamine contributes to air, land, and water pollution, so it is far from eco-friendly. Luckily, melamine isn’t the only material used for storage containers and kid’s dishes. You can get disposable plates made from bamboo, reusable wood plates, laminated glass, and stainless steel. The best option in this respect is stainless steel dishware. Disposable plates from bamboo aren’t a very practical idea. Most parents want something that they only have to buy once for their child. The idea of less dishes is an inspiring one, but it will be a lot more expensive over time to have to continuously buy new dishes every few months. Reusable wood plates are slightly better than disposable bamboo ones, but if you’ve ever owned a wooden chopping board you know how it does not go through wear and tear very well. Okay, so your child isn’t going to be using a steak knife, but it is also prone to staining as it starts to lose its protective coat. Next one the list is laminated glass. Laminated glass markets itself as crack and break resistant. The word ‘resistant’ signals an alarm bell here. Resistant doesn’t mean it won’t happen. It just means it’s less likely to happen. Again, this is simply an impractical choice as an alternative to melamine. If melamine was still used on the adult dinner table, it would be a better option. However, we’re considering alternatives to melamine that can be used for kids dishes because you don’t see anyone eating their steak off a melamine plate anymore. As such, glass that is heavy and will definitely receive a crack or break is not safe for a kid. Finally, we have stainless steel. Of the four alternatives to melamine, this is by far the best option. Stainless steel compares favorably to melamine because it is also unbreakable and is much better for the environment and our kids. It is a much more practical option than any of the other alternatives because it doesn’t scratch or dent and will not harbor bacteria or break. It also doesn’t impact the flavor of our food, and you as a parent can rest assured that stainless steel does not leach any toxic chemicals into your child’s dinner.